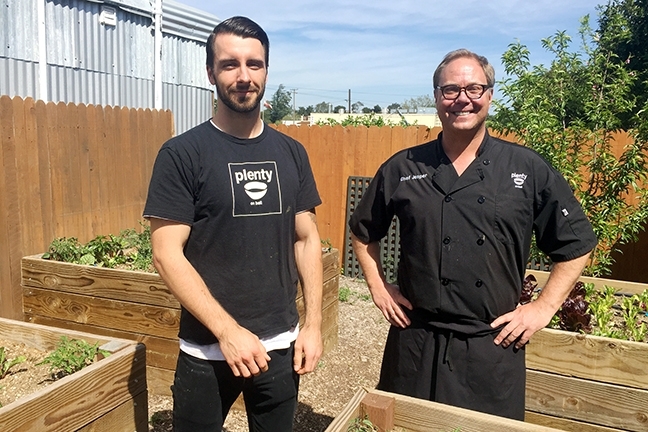 Inside Plenty on Bell on a sunny Tuesday afternoon, chef and new co-owner Alec Roehl makes small talk with a pair of customers. They tell him how much they love the food and ask him questions about his family. They’re more like visiting relatives than fussy diners, which is the norm inside the Los Alamos eatery. Roehl and I exchange pleasantries as he takes a break from his duties to talk shop. Roehl is easy-going and affable, a chef who delights in talking about his food. He’s methodical in a charming way, not a braggart but definitely proud. Bob and Carol Newman chat with Chef Alec Roehl (left) about their ongoing specials. The Nipomo couple has been coming to Plenty on Bell for more than a year, they said, and are loyal fans of Chef Jesper Johansson’s food. “We love the restaurant,” Carol Newman said. The garlic egg drop soup makes a snappy and well-composed bite. Made from their own house-made batch of stock with a generous amount of garlic (I can never get enough garlic), cayenne pepper, and paprika, it has the perfect element of heat. When it arrived, I felt like stealing a line from a Barbra Streisand movie. Hello, gorgeous. This is what Plenty on Bell is known for: simple dishes that taste like fine dining. The venue is one of the most popular and talked-about restaurants in Los Alamos; customers have been flocking here since original owners Tracey Ryder and Carole Topalian (founders of Edible magazine) opened it in 2016. In January, head chef Jesper Johansson and his sous chef Roehl officially took the restaurant over, marking the first time either of the two chefs had owned their own establishment. I ventured to Los Alamos curious to see what changes these new chef/owners might have in store. Were they going to dismantle the comfortable casual ambiance in favor of something more extravagant? Would they drop an entirely new menu on loyal customers? Turn it into a fast food sushi joint? Imaginations run wild when predicting how restaurants evolve. The first thing I noticed is that the venue looks very much the same. I wasn’t walking into neon walls with conceptual art hanging from the ceiling. This was still the same place, thankfully, yet somehow slightly different. It felt more airy and open, which I would later learn was a top priority for the new co-owners. When I arrived, Chef Johansson popped his head out to politely apologize for being backed up. As he would later tell me, his kitchen is his happy place, a special sanctuary. Chefs who work with him describe him as eagle-eyed, with a rigorous attention to detail for every element that goes on his plates. Johansson’s easy-going nature and precise dishes have earned him a substantial fan base, one that followed him to Plenty on Bell after Cafe Quackenbush shuttered. He is more comfortable making small talk with customers, casually socializing on the patio than hobnobbing with food and wine writers speculating about his food philosophy. 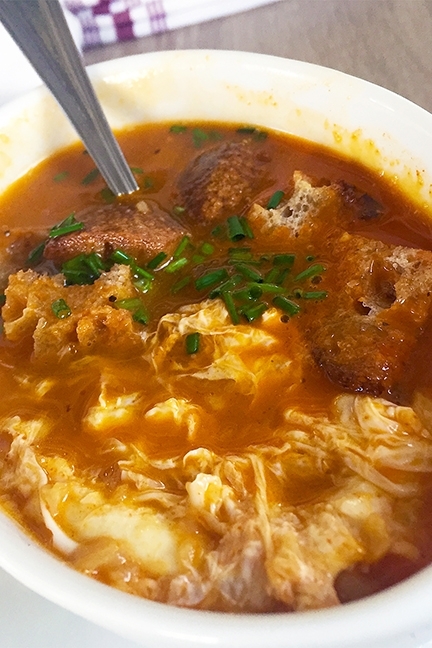 Dive into a bowl of Plenty on Bell’s garlic egg drop soup, one of the many daily specials the venue serves. In addition to breakfast and lunch, Plenty on Bell also offers a Friday night dinner, featuring dishes such as chicken pot pie and fried chicken. Roehl doesn’t show a hint of trepidation about his new role. Their creative partnership, which has lasted more than a year now, has been productive for both chefs. Local food lovers tend to crinkle their nose at too much change. It’s a delicate process in the restaurant business that can be disastrous in either direction. Johansson and Roehl seem to understand that balance and they realize the best way to stay progressive without seeming suddenly alien is to actually listen to their customers. Roehl reads comments on social media, including Instagram, and always takes them to heart. One of the first major changes was bringing back breakfast, a customer favorite that had been nixed by the previous owners because it became too hectic to handle in the small kitchen. Roehl and Johansson felt strongly about bringing it back to please their longtime fans. But space limitations were still an issue; Plenty on Bell has a smaller kitchen than most venues that serve huge crowds of diners. So they made compromise. One of the menu items that pleases their fans most is the short rib hash. Braised for almost 10 hours until it falls apart, the meat is grilled with potatoes, onions, garlic, and thyme and served with horseradish sauce and eggs. They also wanted to mix breakfast staples like egg sandwiches with something more unique. Johansson and Roehl came up with a take on a breakfast burger, featuring a patty of maple fennel sausage made in-house and garnished with onions, tomatoes, maple sauce, and fresh cilantro. Making the patio more visible to guests passing by was also another huge priority. Plenty on Bell fans can rest easy knowing Johansson and Roehl haven’t gone completely off the deep end to put their own stamp on the eatery. By listening to their customers and experimenting with alterations, they know they won’t alienate their fan base. The venue continues to evolve and grow as a local standout. As for that dining philosophy food writers love to go on about? Arts and Lifestyle writer Rebecca Rose’s food philosophy is to eat lots of it. Contact her at rrose@santamariasun.com. • Start a salad club! This is a great way to get into healthy eating habits. Once a week, gather your colleagues or friends for a homemade salad lunch with all the fixings, like we do at the Sun (pictured). Try it at work or at home by taking turns and experimenting with unique salads and ingredients. With Downtown Fridays and the farmers market back in swing in Santa Maria, residents now have no excuse not to snap up weekly supplies of fresh fruits and vegetables from local vendors. You’ll thank me for giving you a good excuse to socialize and to take a break from fast food. • We talk about wine so much in this region sometimes it’s easy forget all the other delicious alcoholic beverages there are to enjoy. Rooney’s Irish Pub is hosting Whiskey Wednesdays every week, featuring $15 whiskey flights and half off Irish whiskeys. The variations in flavors of different types may surprise you if you’re not a whiskey aficionado. Celebrate your inner Irish cowboy at 241 S. Broadway, suite 101, Orcutt. • If you remember celebrating Easter with a batch of hot cross buns, you are in luck. Bob’s Well Bread plans to sell them from April 14 through 16. Get down to 550 Bell St., Los Alamos, for a taste of tradition.